Imogen and her friends have had their fill of budget holidays, cattle-class flights and 6 a.m. offensives for a space by the pool. So when one of the group wins a VIP holiday at Barcelona’s hippest new hotel, they plan to sip champagne with the jet set, party with the glitterati and switch off in surroundings of unapologetic luxury. But as they mingle with movie stars, mafia bosses and millionaires, it becomes clear – with riotous consequences – that even in the most glamorous of locations, things can go wrong. Very wrong . . . 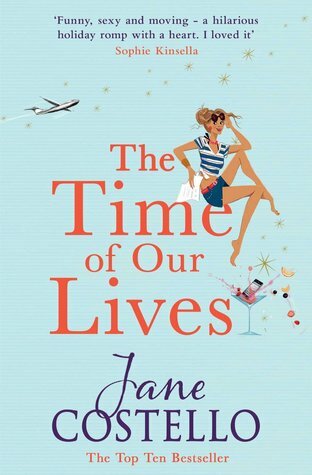 Hilarious and heart-warming by turns, The Time of Our Lives is Jane Costello at her very best. My opinion: Jane Costello is one of my favourite authors, and when I saw that her new book was available as an ARC on Netgalley, I clicked Request straight away! The story starts off with three friends on a grotty break for a hen do. After a number of unfortunate events, they vow to save up for a luxury holiday together! Fast forward six years and they are finally going on a luxury holiday thanks to a lucky competition win and negotitation with the travel company to turn it from a romantic holiday for two into a luxurious break for three. The only difference is that they are all now nearing thirty, Imogen has a young daughter and a traumatic past, and Meredith is extremely pregnant. What could possibly go wrong?! This is another fantastic book from Jane Costello and I honestly think that with every book I read, her writing just gets better and more hilarious!! I’ve read her last two books lying on a sunlounger in Gran Canaria and Rhodes, so reading this one in a very wet Wales was a different reading experience. Luckily this one transported me away to Barcelona with the girls, so that made it a lot better! I was on a bit of an emotional rollercoaster with this book. As can be expected from a Jane Costello book, there were loads of laugh out loud funny moments, but there were also a few bits where I could feel myself welling up. Although it had some sad moments, it wasn’t a depressing book by any means, but quite uplifting and a great story about friendship and coming to terms with the past. A really great read, and I’m sure it will grace the side of many pools over the summer. I would definitely recommend this one and am just sad now that I will have to wait again for the next one! My rating: A fantastic five stars!! I received an advance copy of this book courtesy of Simon and Schuster UK and Netgalley in return for an honest review.